Bring the California Pizza Kitchen into your home. 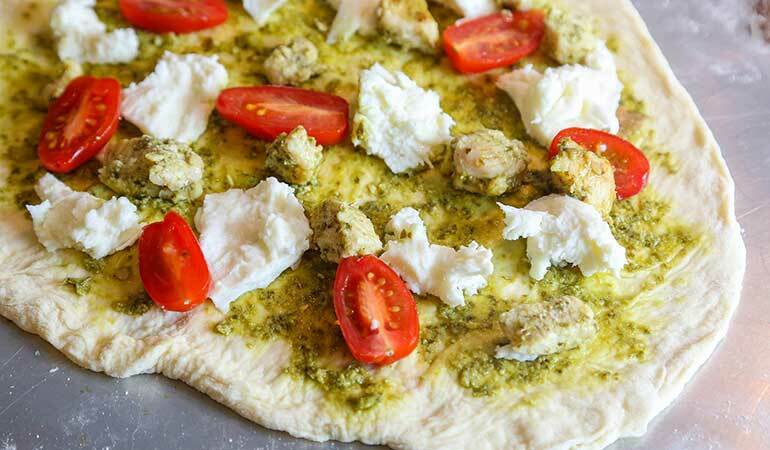 Wild turkey breast, fresh basil pesto, melty mozzarella cheese and juicy grape tomatoes over a toasty, slightly chewy homemade pizza crust – you'll want delivered pizza less often after making this. Serve this pizza with wines such as pinot grigio, dry Riesling, chardonnay, rosé, sauvignon blanc or even a light red such as pinot noir. Note: Use your favorite pizza dough recipe or store-bought crust. Because the toppings are simple and fresh, I suggest using thin crust over deep dish to prevent overwhelming the ingredients. For this recipe, I used Peter Reinhart's pizza dough recipe, which can be found at www.101cookbooks.com. It tastes amazing, although time consuming and tricky to learn at first. This dough needs to be made a day in advance, but the results are worth it. So if you have the time and willingness, I suggest you give it a try. It's a recipe worth adding to your repertoire. At least 45 minutes before baking, preheat oven and pizza stone (if you're using one). 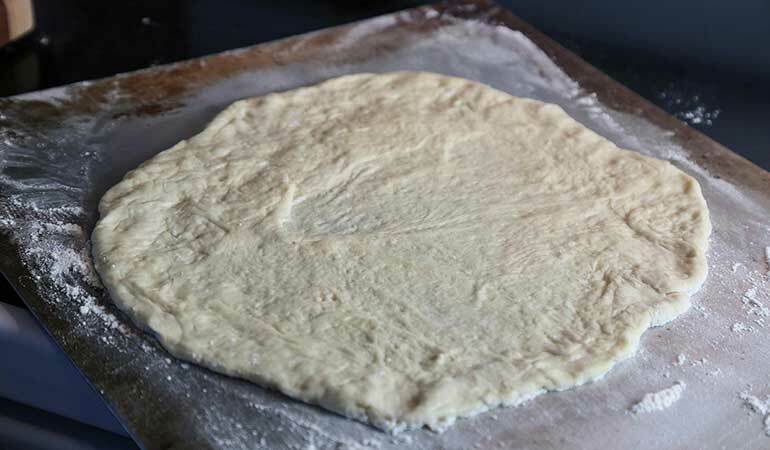 Reinhart's pizza dough recipe required me to place the stone at the lowest rack in a 500-degree oven, but this may not be true for your recipe or premade crust; follow your own recipe or package directions as usual. Remove silver skin from wild turkey breast. Cut into small cubes and marinate with a tablespoon or so of pesto sauce. Heat a small pan over medium-high, and sauté turkey with oil until nearly cooked through. Allow meat to cool. Prepare pizza dough accordingly. 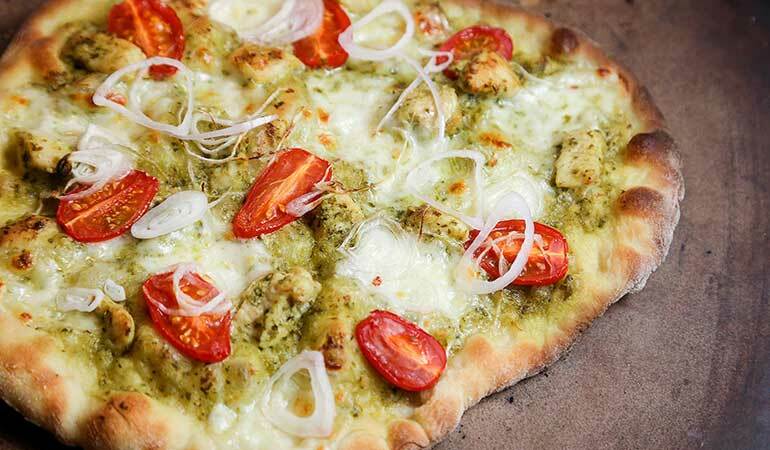 Spread a thin layer of the pesto sauce onto each crust. Tear off pieces of mozzarella cheese and evenly distribute between the two pizzas, along with halved tomatoes, thinly sliced shallots and cooked turkey. Use as little or as much topping as you'd like – I don't suggest overloading your pizzas, which can prevent the dough from cooking properly. Bake pizza in a preheated oven until crust is golden and cooked through, and cheese has melted. For best results, use a pizza stone.